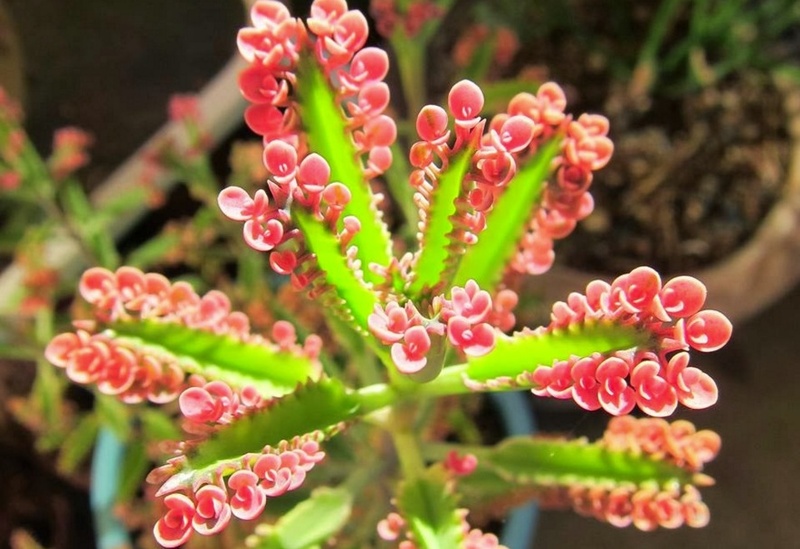 Share the post "Kalanchoe Pink Butterflies – Mother of Thousands Beautiful Hybrid"
Belonging in the family Crassulaceae, Kalanchoe is a perennial, evergreen succulent native to Africa, Madagascar and some areas of Asia. Depending on the particular cultivar, plants bloom in a vast range of colors including white, red, pink, yellow, orange and purple. Kalanchoe is a hardy, relatively maintenance-free plant. Its bright sprays of flowers attract butterflies and hummingbirds, making it a welcome addition to butterfly gardens. All parts of the plant are poisonous (they contain daigremontianin and other bufadienolides), which can even be fatal if ingested by infants or small pets. Kalanchoe “Pink Butterflies” is an incredibly colorful variegated form of an old hybrid that was hard to track down its heritage. The original hybrid was known as ‘Houghton’s Hybrid’, and was a cross between Kalanchoe diagremontiana aka the Mother of Thousands and Kalanchoe delagoensis (aka Kalanchoe tubiflora). At some point a variegated sport of this hybrid appeared and ‘Pink Butterflies’ came to be. The difference between the parent plant and the “daughter” is that both parents of the original hybrid are “viviparous”, producing hundreds of tiny plantlets on their leaves that readily fall from the parents root with little to no effort. ‘Pink Butterflies’ while still producing copious quantities of tiny pink butterfly-like plantlets on its leaves have lost their ability to root from plantlets. Sometimes a couple might take, but in general, no. They are pink because they lack chlorophyll. Thus like any of a variegated plant that lacks chlorophyll, they simply die. Several cultivars of Pink Kalanchoe such as Carnea, Bingo and Sensation range in colors from light pink to vibrant, dark pink. Plant type: Tropicals and Tender Perennials. Cactus and Succulents. Evergreen. Moisture: Drought Tolerant, Average Water. Do not overwater. Propagation: from leaf cuttings. Allow cut surface to callous over before planting. By air layering. From bulbils. Uses: Containers. Suitable for xeriscaping. Indoor/ Outdoor (Patio). Tips: Drought tolerant when established. Do you grow Kalanchoe Pink Butterflies in your garden or as a houseplant? What is your experience with this plant? Please share with other fellow gardeners in the comments below! Do you sell Kalanchoe Pink Butterflies seeds or have plants for sale? You can place your advertisement here. Contact us now! I have a Kalanchoe Mother of Thousands. I´m taking caring it. But his flowers anren´t pink… They are brwon… What’s is wrong? Oh, If is something normal, i can be calm now 😀 Thanks Lensa. I have been growing Kalanchoe daigremontiana X delagoensis (Houghtonii) ‘Pink Butterflies’ for a couple of years. I have found that they are mostly monocarpic in habit- that is, at the end of the season (or after blooming), they lose their vigor, and tend to die out- at least that has been my experience. The way to keep them going, is to propagate the plants by stem cuttings, while they are still actively growing. I am not sure that the ‘pink butterflies’ are related to variegation of the plant- I have two plants: one is variegated, and the other is not, but they both have the ‘pink butterflies’ plantlets, on the edge of the ‘leaves’ (phylloclades).